The intake pipe of the V8 GEMS has two "boxes" on it, I assume these are there to equalize pulses in the intake, please correct me if I'm wrong.. If I take these boxes of, does it increase throttle response? Anyone who modified the intake? I've got one car that has them and one that someone has cut them off and plugged the holes. Seems to make no difference at all. that box is an intake muffler, it allows for quiet engine operation under heavy throttle. if removed it makes the engine sound similar to a japanese tuner. otherwise no difference at all. Muffler I wouldn't have thought..
Guys, another thing to watch is that the bottoms of these can have holes melt in them due to the proximity of the exhaust manifold. I so, good quality silicone sealant will fix the issue. If there are any holes, of course you are getting unfiltered air straight into the engine. btw, if I do recall correctly, the gems had a flexible rubber hose similar to the later 14cux. the one pictured must have come from a discovery 2 which if my memory is correct the only model to have used plastic and not rubber intake pipes. I've got a 96, a 97 and a 98 here at the moment. The 96 has the rubber one, the other two have the one shown above. I suspect they found the rubber ones were perishing (or the plastic ones were cheaper). I can confirm the intake is different between 95/96 and 97/98 GEMS, along with some other changes. My rego papers say mine is from 1997, the sticker in the engine bay says 1996. They probably changed to the the plastic version when they gave the GEMS the narrower air filter and box? Early on I bought a filter for my GEMS based on the fact that it was registered in December 1996 to find it didn't fit ('97 model) and it actually took the same filter as used in the other one (a '98 registered / '99 model) Bosch. If I'd opened both bonnets and looked first I'd have researched it in advance and thought about which model year version was actually needed. the rubber hoses for the gems became unavailable for about two years, in the meantime the factory installed hose begun to deteriorate just as thor engine made it to market thus, many shops took advantage of this occasion and retrofitted many gems with bosh intake hose. the plastic hose was never installed from factory to the gems, it was an aftermarket retrofit. Rubbish! If you look at a GEMS plastic intake and a Thor plastic intake you will see they are totally different and not interchangeable. Rubber one (ESR2921) up to VIN TA346973, Plastic one (ESR4216) from VIN VA 346974 to WA410481 (which is the one shown in the OPs picture). Then there are two further different ones for the Thor, PHD103610 for an XA prefix VIN and PHD104050 for YA and later prefix VIN. Intake Outlet Pipe - Replace/repair? 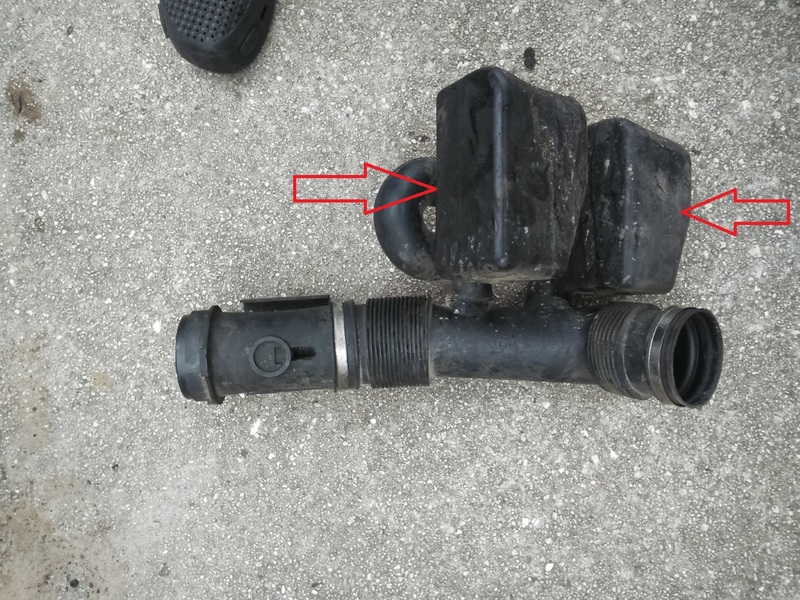 Glue for the Air Intake Pipe?